It’s been a while since I did a clothes haul post, not because I haven’t been shopping but because I keep taking the pictures and then forgetting to write up a post! Anyway, I did a spot of shopping the other day on a very rare day off and it ended up being a pretty successful day! Lots of classics which I think I’ll wear for a while but I still want a few trendy pieces to liven up my wardrobe. I’ll do a separate post on these soon. First stop was Matalan for a change as I usually head straight to Primark! I was really lucky they had some nice pieces so here they are. I found two pairs of black pumps, some bargain jewellery, a black skater dress and a winter Nordic ski jumper as well as some jewellery bits. The pumps are both black, the first pair is an embellished ballet pump (£12), the second a pair of slip on loafers but in a pony hair (£10)! Picked up some boring tights (yawn but it’s an essential) and check out all this jewellery! 4 pairs of earrings for £1 which I bought just for the gold horseshoes earrings, a pair of brushed gold dove bird stud earrings, a gold coin necklace similar to the one Holly Willoughby wears all the time and this gorgeous vintage look enamel A initial double strand pendant. The black skater dress is plain but perfect! It’s the style of dress that I wear most and that suits me the most and it also has an exposed zip at the back. Last but not least is this cosy cream Nordic ski jumper. It’s quite a long style which I’ll be wearing loads no doubt in winter; don’t you always find your wardrobe full of short sleeved tops and never any jumpers?!! Have you guys got your jumpers out yet?! 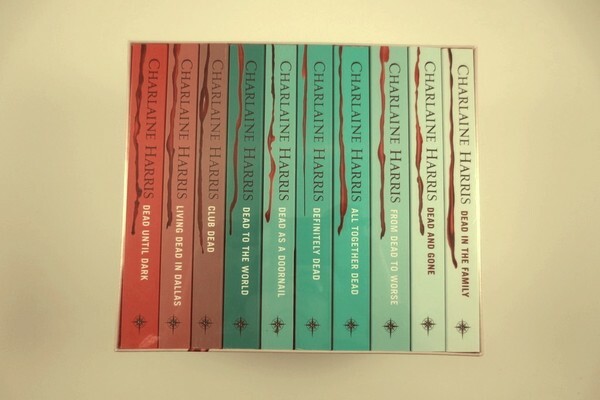 I must be the last person to be jumping onto this bandwagon but I've finally got round to purchasing the True Blood novels! I'm usually a fan of vampire novels and TV but the TV series was just too gory for me. So hopefully the books won't be as bad. 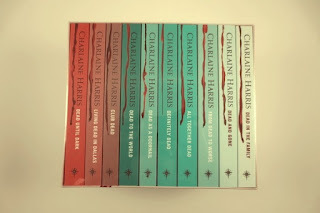 Have any of you guys read the True Blood novels? What did you think? I'm trying to be good and update the blog a lot more and include non beauty related posts too. Let me know what you think!! 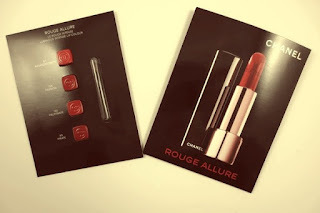 Did any of you guys get an email from Chanel recently with an invitation to try out Rouge Allure? I love the way they phrase that, don't you?! This was a few weeks back but I just wanted to share this with you anyway. The sample is for four red lipsticks from the range in shades 97 Incandescente, 104 Passion, 102 Palpitante and 99 Pirate. It also came with a teeny tiny lip brush! The samples are quite small but enough I think for a decent trial. Remember how years ago you used to get those tiny little lipstick bullets as samples?! Have you tried these out yet? What's your favourite colour? Do you ever feel like it's feast or famine when it comes to magazine freebies? Some months there's nothing, and other months I end up blowing loads on multiple copies of the same magazine just so I can get the gorgeous products they come with. This month was a definite feast! I purchased In Style and Marie Claire (three times, I'll explain later!). First up is In Style with Naomie Harris on the cover. I bought this for the Benefit products it came with as I wanted to try out Sun Beam. For the £3.80 cover price there is a choice of Benefit Sun Beam, Cha Cha Tint or Benetint. These are all 4ml in size. Inside, there's also a voucher for a free sample of Benefit Bad Gal Lash Mascara which I've pictured with the magazine. Next up is Marie Claire with Taylor Swift on the cover. I knowingly purchased this twice. The first copy I got is the full sized edition which came with the L'Occitane 30ml Mango Flower Hand Cream. In some places it seems you also get a free 50ml sample of a Dove product which doesn't seem to be advertised in the magazine. I got Dove hair Therapy Conditioner Colour Radiance. I then bought the travel sized edition to get the Rose Petals Hand Cream. When I actually started reading Marie Claire I realised it was looking really familiar. Which is when I realised I'd started a subscription for Marie Claire (it was a special offer of 3 issues for £1) but had received the magazine ages ago and forgotten all about it. Needless to say, the subscription version doesn't come with a freebie which is one reason why people are often put off subscribing. Marie Claire is also meant to come with a three sample packet of Tresemme Split Remedy Shampoo, Conditioner and Leave In Treatment, but I only received this once with my travel sized edition from in store. But I'm glad I;ve got one sample at least and I'll definitely be trying it out. Which magazines did you get this month? Hi everyone. 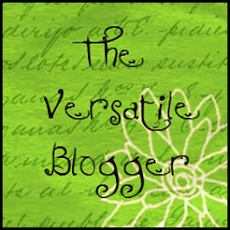 So sorry for my shamefully long absence from blogging. I went away on holiday for two weeks in September and since then I've been playing catch up with everything! But I'm going to try and get back up to speed, at least 2 posts a week asap. So, my empties posts are so shamefully short, but I wanted to do this one so I could rave about Steam Cream! I was going to do a holiday mini's post which may still happen, but until then I'll show you a few pieces that saved me from overpacking hell (that's pretty much a lie, I still overpacked!). The outstanding product award goes to this beautiful tin of Steam Cream in the Yoshino cherry blossom tin. Before I left this was new. Now it's finished. That's because I used it every single day whilst I was away. I used it on the plane as a hand cream (it's small enough to take on board) and every single day as a facial moisturiser, hand cream, body cream and after sun lotion. It performed so well in every category! This is definitely my number one recommendation for anyone who's packing for a holiday; do not leave without it! Other than that it's just my sample size Sensodyne Repair and Protect toothpaste (this 20ml tube was not enough for a 2 week holiday!!) and a Sure roll on in Radiant which is so much smaller for travelling than a spray.